Play one of the most beautiful courses on the NSW south coast. Enjoy golf the way you want it and never fight for a tee time. Jamberoo Golf Club remains the best value membership in the Illawarra area and remains the hidden gem at the bottom of the Jamberoo pass with easy access from the Southern Highlands. 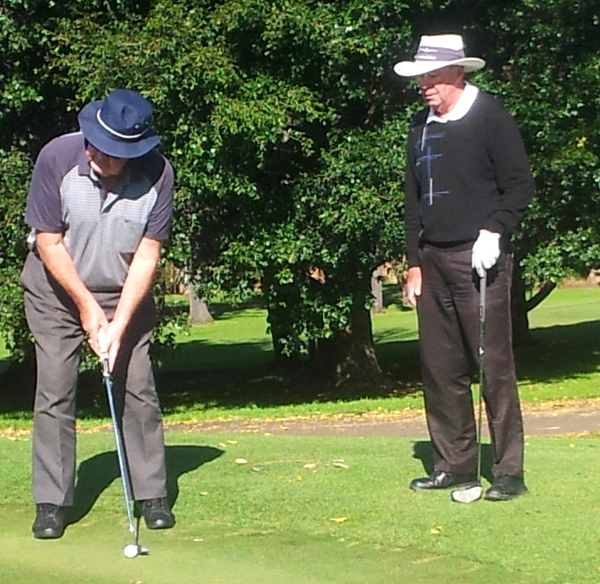 As a member of Jamberoo Golf Club you can take advantage of all the benefits of membership, including access to all club competitions and unlimited use of the course for practice and social golf. The membership financial year is coming to an end on May 31. Anybody joining now gets the very special deal of 14 months membership for the price of 12. For 2018-19 the membership fees have been set at a single payment of $540 for a full year, or two 6 monthly payments of $275. For members between the ages of 18 and 24 the amount due is $270 and for juniors (less than 18) the amount due is $40. I was playing with a gentleman last week and witnessed him slice his tee shot on 9 onto the roof of the greens-shed. How should he have proceeded? D Found the point where his ball first entered the compound and taken free relief of one club length from this spot. There have been very heavy dews and rainy weather about and subsequently the greens are soft and easily susceptible to sprig and scuff marks, especially near the holes. Many of us seem to twist as we bend to pick the ball out of the hole and some of us don’t lift our feet as we walk towards the hole. Be aware and check for any you have made as you finish your putting. Help get our greens in good order. Neat casual clothing at all times. Predominantly white sports socks allowed. Attire not permitted includes: football clothing, singlet type shirts, advertising type T-shirts and track type clothing. Member Gary Harvey took his attire very seriously last Wednesday winning the ‘best dressed award’. Gary looked like a player from the 1930’s with his collared shirt and tie. It didn’t seem to affect his swing either as he launched several booming drives onto the fairways. The tie did seem to get in his way when he putted though and it soon ended up like a noose about his neck! With the US Masters being played this week it reminds me that Augusta is not the only course with its holes named. Jamberoo also follows this tradition with some geographic or botanic feature being used in each holes name. In a new series of articles each week one of our holes will be highlighted with its name and a suggested way of playing that hole. 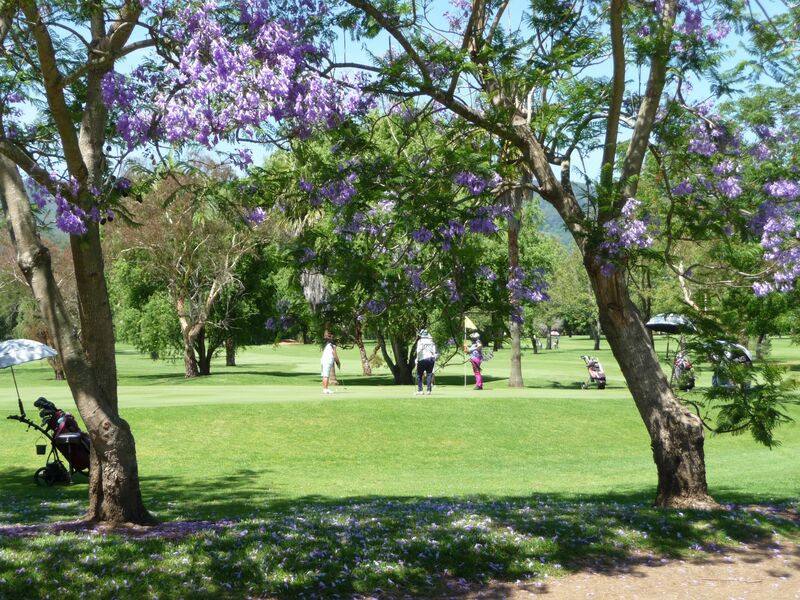 This week we will be looking at the 10th, which is known as ‘JACARANDA’. Your tee shot must carry 180 metres or more avoiding the trees on the left hand side of the narrow fairway. This will leave you with a short iron into the large green. If the tee shot carry is too much then the smart player lays up to the centre of the large fairway leaving a long iron or fairway wood approach from about 160 metres. In either case be careful with your approach as a water hazard sits to the right of the green. Have you a favourite story to tell about the 10th? If you do , share it in the comments section. For a full listing of each hole look under the ‘Course’ tab and then ‘hole by hole’. Cooler weather made the conditions pleasant to play this week, but the course was playing difficult with hardly any run. Despite this several good rounds were recorded with perhaps the best coming from Jenelle Anderson in Tuesday’s Ladies monthly medal. Jenelle fired a very nice 67 (it is par 71 for the ladies). Lance Fredericks fired a good 41 points on Easter Monday to win easily. On Wednesday in the Drummond Golf Stableford Kiama’s John LAwler upstaged all the members to win the Drummond Golf Voucher with 39 points. Italo Baraldi was the next best with 38. Keith Hales won the D grade with 35 points underlining how tough the course played on this day. Mark Fisher, playing with Keith finished with 37 points to finish 2nd in A/B grade. Pam Middlebrook and Shirley Dixon were the stars in the Lady Veterans Ambose winning by 1/4 of a stroke from Marie Farrant and Robyn Gregson. Ken Bradley brought his pennant form to the course on Saturday to not only win the A Grade monthly medal but also the day’s lowest score prize with a 73. B Grade medalist was Geoff Reynolds, C Grade Gary Hemus and D grade John Turner. Jenelle Anderson completed a good week taking out the Ladies comp. Finally John Keeling wishes it be known that he knows how to motivate the writer into playing well after my very lucky 44 points last Saturday. Chat me up as I walk down the first. John believes I should thank him for his psycological ploy! John Ellsmore thinks there should be an enquiry after I shot 44 on Saturday and 20 on Monday – as the saying goes,”from the penthouse to the outhouse”. Dave. In relation to your ruling about slicing the ball on the 9th into the Greenkeeper shed I might remind you that many of us lefties would in fact be hooking our ball to that area. Does the same ruling apply? I’m confused, don’t you stand to the right of the ball? Dave thanks for another great newsletter! Cheers Geoff W.